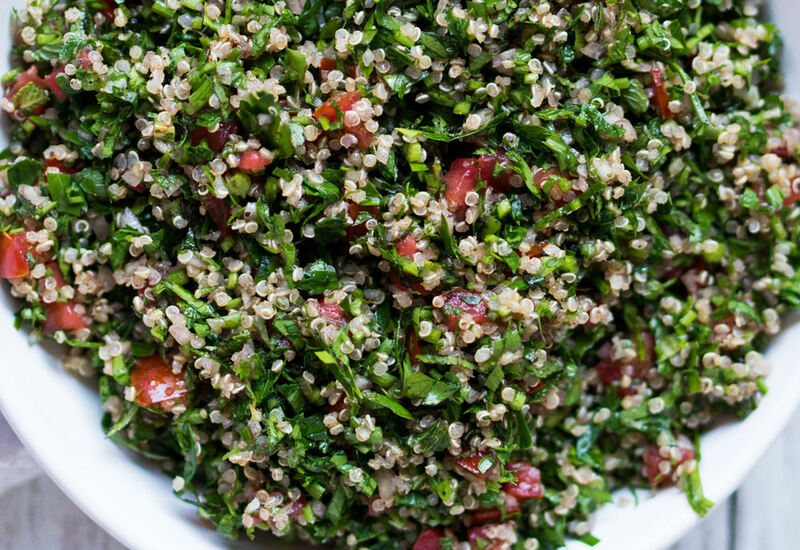 This is a gluten-free version of a traditional Middle-Eastern tabbouleh, which is typically made with bulgur wheat. The results with quinoa as a wheat replacement are no less delicious, as the parsley and mint maintain their star status in this salad. This is a great quick and easy lunch to make in advance and enjoy straight from the fridge. It also serves as a flavorful side dish when served along grilled or roasted meats such as beef, chicken, or lamb. Substitute quinoa in other recipes using less nutritious grains such as rice. The nutritional profile will be increased and no other grain can compete as far as protein goes since quinoa is a complete protein. Try the different colors of quinoa too. There is white, red, or black. You can also find all three together, in a tri-colored version at Trader Joe's. Per Serving: 119 calories; 10g fat; 6.5g carbohydrates; 1g protein; 0mg cholesterol; 217mg sodium. Delicious and so easy to prepare. Quinoa, when done right, is a hit. This is one of those times, and the allspice and cinnamon in the dressing add a really unique touch. This tabbouleh with quinoa was really delicious. I served it with pita chips, super simple! I added a little extra salt and lemon for flavor, but other than that this was easy and impressive in regards to the flavors.